HFB is donating $25 to a local charity for each closed, residential mortgage loan in 2017 for their "Year of Giving". Each quarter a local charity -- with a mission based around housing -- will be chosen to receive the donation. 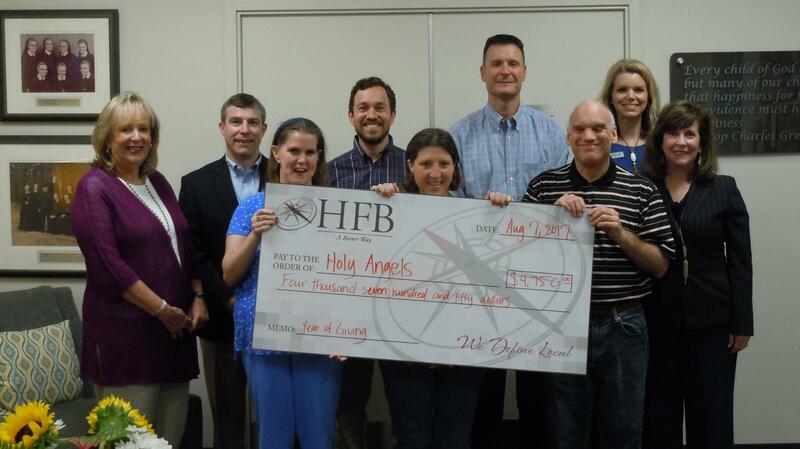 HFB closed 190 residential first mortgage loans during the second quarter of the year, continuing their "Year of Giving" with a donation of $4,750 to Holy Angels. "Holy Angels is an asset to our community and we are proud to support their efforts." said David Barber, Sr. Vice President of Mortgage Lending for HFB. Back row L to R: Karen Dill, Board Member of Holy Angels, Chris Walls, VP of Commercial, Stephen Major, Mortgage Loan Officer, David Barber, SVP of Mortgage and Kristin Powers, Development Director of Holy Angels. Front row L to R: Laura, Megan, Billy and Laurie Boswell, CEO of Holy Angels.